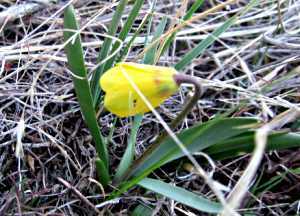 As predicted here earlier, this year is seeing the earliest arrival in recent memory of this harbinger of spring, Fritillaria pudica. Last year it was April 5th, and April 7th in 2003. I can't believe it was as late as May 2nd in 2002. Don't know what happened in 2001, but in 2000 it was April 9th.